Funafuti is an atoll on which the capital of the island nation of Tuvalu is located. It has a population of 6,025 people, making it the most populated atoll with 56.6 percent of Tuvalu's population. It is a narrow sweep of land between 20 and 400 metres (66 and 1,312 feet) wide, encircling a large lagoon (Te Namo) 18 km (11 miles) long and 14 km (9 miles) wide. The average depth in the Funafuti lagoon is about 20 fathoms (36.5 metres or 120 feet). With a surface of 275 square kilometres (106.2 sq mi), it is by far the largest lagoon in Tuvalu. The land area of the 33 islets aggregates to 2.4 square kilometres (0.9 sq mi), less than one percent of the total area of the atoll. Cargo ships can enter Funafuti's lagoon and dock at the port facilities on Fongafale. The capital of Tuvalu is sometimes given as Fongafale or Vaiaku, however the entire atoll of Funafuti is officially the capital. The largest island is Fongafale. The island houses four villages and community meeting places. The Funafuti Falekaupule is the local council, with the Kaupule as the executive of the Falekaupule. On Fongafale, the Funafuti Kaupule is responsible for approvals of the construction of houses or extension to an existing buildings on private land and the Lands Management Committee is the responsible authority in relation to lands leased by Government. Tausoa Lima Falekaupule is the traditional meeting house on Funafuti – Tausoalima means "hand of friendship" and Falekaupule means "traditional island meeting hall." There is the Vaiaku Langi Hotel, and other guesthouses as well as homes, constructed both in the traditional manner, out of palm fronds, and more recently out of cement blocks. The most prominent building on Funafuti atoll is the Fetu Ao Lima (Morning Star Church) of the Church of Tuvalu. Other sites of interest are the remains of Japanese aircraft that crashed on Funafuti during World War II. The airfield was constructed during World War II and is now the Funafuti International Airport, which serves both as the airstrip for the flights from Fiji as well as providing a place for sporting and other recreational activities. A major sporting event is the "Independence Day Sports Festival" held annually at Fongafale on 1 October. The most important sports event within the country is arguably the Tuvalu Games, which are held yearly since 2008 with teams coming to Funafuti from the outer islands to compete in the games. Football in Tuvalu is played at club and national team level. The Tuvalu national football team trains at the Tuvalu Sports Ground on Funafuti and competes in the Pacific Games and South Pacific Games. The Parliament of Tuvalu or Palamene o Tuvalu is located on Fongafale together with the offices of the government departments and the government agencies including the Tuvalu Telecommunications Corporation, National Bank of Tuvalu, Tuvalu Philatelic Bureau, Tuvalu Meteorological Service, Tuvalu National Library and Archives and the Tuvalu Media Department that operates Radio Tuvalu. The police service has its headquarters on Fongafale. The High Court of Tuvalu is also located on Fongafale, as well as the jail. The Princess Margaret Hospital, which is the only hospital in Tuvalu, is located on Fongafale. Access to the Funafuti Conservation Area is by boat; the Conservation Area is 15 kilometres (9.3 mi) across the lagoon from the main island of Fongafale. There are at least 29 islets in the atoll. The biggest is Fongafale, followed by Funafala. At least three islands are inhabited, which are Fongafale, the main island in the east, Funafala in the south, and Amatuku in the north. The atoll has several passages with varying degrees of navigability that lead into the lagoon. The passes are listed clockwise, starting south of Fongafale islet. The first two clearly separate the southern part of Funafuti Atoll from the rest. Te Ava i te Lape is the favoured entrance into the lagoon, although it has a depth of only 5.8 metres, and a width of barely 500 metres. It is in the north, between the islets of Pava to the east and Te Afualiku to the west. The lagoon (Te Namo in Tuvaluan) of Funafuti atoll has a north-south length of 24.5 km, and east-west 17.5 km, with an area of 275 km², making it by far the largest lagoon of Tuvalu. It is up to 52 metres deep, but has several submerged rocks and reefs that are coming as close as 6 metres to the surface. The founding ancestor of the people of Funafuti is described as being from Samoa. 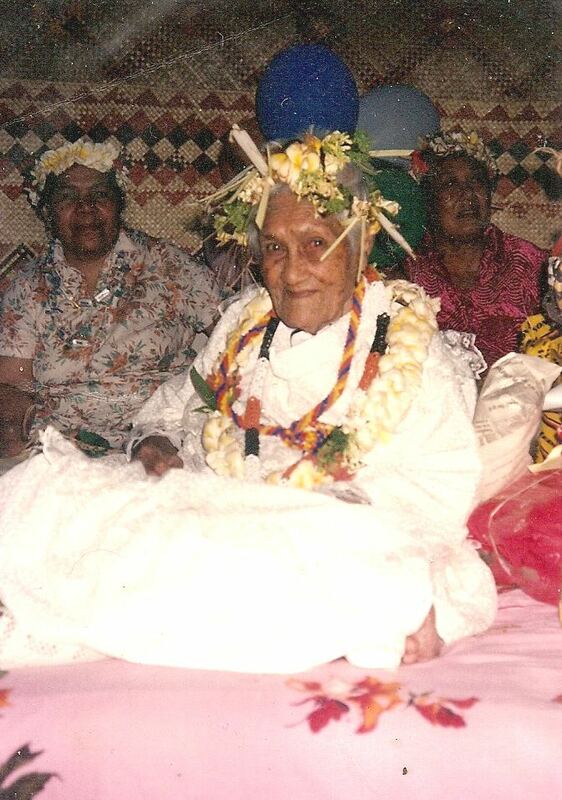 The name of one of the islets Funafala means 'the pandanus of Funa', the name of a chief, after whom also the atoll has been named Funafuti. The first European to visit Funafuti was Arent Schuyler de Peyster, of New York, captain of the armed brigantine or privateer Rebecca, sailing under British colours. Arent Schuyler de Peyster passed through the southern Tuvalu waters in May 1819 sighting Funafuti, which he named Ellice's Island after an English Politician, Edward Ellice, the Member of Parliament for Coventry and the owner of the Rebecca's cargo. The United States Exploring Expedition under Charles Wilkes visited Funafuti in 1841. The US claimed Funafuti under the Guano Islands Act from the 19th century until a treaty of friendship was concluded in 1979, coming into effect in 1983. John (also known as Jack) O'Brien was the first European to settle in Tuvalu, he became a trader on Funafuti in the 1850s. He married Salai, the daughter of the paramount chief of Funafuti; with his name continuing on Funafuti. Alfred Restieaux was a trader on Funafuti from July 1881 until about 1888 or 1889. Thomas Andrew (photographer) visited Funafuti in about 1885-86. In 1892 Captain Davis of HMS Royalist, reported on trading activities and traders on each of the islands visited. Captain Davis identified Jack O'Brien as being a trader on Funafuti; who was also identified as being on the atoll in 1896. In 1894, Count Rudolph Festetics de Tolna, his wife Eila (née Haggin) and her daughter Blanche Haggin visited Funafuti aboard the yacht Le Tolna. The Count spent several days photographing men and woman of Funafuti. The boreholes on Funafuti at the site now called Darwin's Drill, are the result of drilling conducted by the Royal Society of London for the purpose of investigating whether traces of shallow water organisms could be found at depth in the coral, as a test of Charles Darwin's theory of coral atoll formation. Drilling occurred in 1896, 1897 and 1898. Professor Edgeworth David of the University of Sydney was a member of the 1896 expedition and was the leader of the 1897 expedition. Photographers on the expeditions recorded people, communities and scenes at Funafuti. Harry Clifford Fassett, captain's clerk and photographer, recorded people, communities and scenes at Funafuti during a visit of USFC Albatross when the US Fish Commission was investigating the formation of coral reefs on Pacific atolls. The population of Funafuti from 1860 to 1900 is estimated to be between 280 and 300 people. Funafuti Post Office opened around 1911. George Westbrook, a trader on Funafuti, recorded a tropical cyclone that struck Funafuti in 1883. At the time of the cyclone struck he was the sole inhabitant of Fongafale as Tema, the Samoan missionary, had taken everyone else to Funafala to work on erecting a church. The buildings on Fongafale were destroyed, including the church and the trade stores of George Westbrook and Alfred Restieaux. Little damage had occurred at Funafala and the people returned to rebuild at Fongafale. 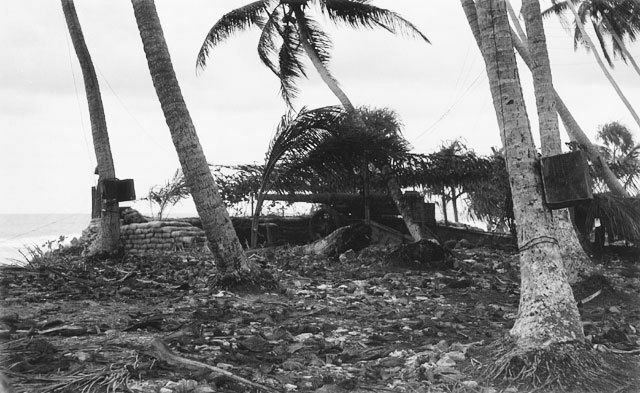 In 1972 Funafuti was in the path of Cyclone Bebe during the 1972–73 South Pacific cyclone season. Tropical Cyclone Bebe was a pre-season tropical cyclone that impacted the Gilbert, Ellice Islands, and Fiji island groups. First spotted on 20 October, the system intensified and grew in size through 22 October. At about 4 p.m. on Saturday 21st sea water was bubbling through the coral on the airfield with the water reaching a height of about 5 feet (1.5 m) high. Cyclone Bebe continued through Sunday 22 October. The Ellice Islands Colony's ship Moanaraoi was in the lagoon and survived, however 3 tuna boats were wrecked. Waves broke over the atoll. Five people died, two adults and a 3-month-old child were swept away by waves, and two sailors from the tuna boats were drowned. Cyclone Bebe knocked down 90% of the houses and trees. The storm surge created a wall of coral rubble along the ocean side of Fongafale and Funafala that was about 10 miles (16 km) long, and about 10 feet (3.0 m) to 20 feet (6.1 m) thick at the bottom. The cyclone contaminated sources of drinking water as a result of the system's storm surge that flooded or destroyed the sources of fresh water. There are two junior schools, the Seventh Day Adventist Primary School and Nauti Primary School, which has a register of more than 900 pupils and is the largest primary school in Tuvalu (45 percent of the total primary school enrolment). The Church of Tuvalu operates Fetuvalu Secondary School. The University of the South Pacific (USP) Extension Centre on Funafuti operates the Augmented Foundation Programme for sixth form students who pass their Pacific Secondary School Certificate (PSSC) so that the students can enter tertiary education programmes outside of Tuvalu. The Tuvalu Maritime Training Institute (TMTI) is located on Amatuku motu (islet). Funafuti International Airport is located on Fongafale. Flights are only available twice a week to Suva, Fiji, on Pacific Sun, the regional carrier of Fiji Airways, Fiji's national airline. Pacific Sun flies ATR 42-500 42-seat turboprops between Suva and Funafuti. The airport code for Funafuti is FUN. There are port facilities on Fongafale. There are two passenger/cargo ships, Nivaga III and Manu Folau, which provide round trip visits to the outer islands every three or four weeks and which also travel between Suva, Fiji and Funafuti 3 to 4 times a year. In 2015 the Nivaga III was donated by the government of Japan; it replaced the Nivaga II, which had serviced Tuvalu from 1989. Funafuti is one of the eight constituencies in Tuvalu, and elects two Members of Parliament. Following the 2015 general election, its current representatives are Kausea Natano and Kamuta Latasi. Both were successfully re-elected incumbents. Sir Toaripi Lauti, GCMG PC (28 November 1928 – 25 May 2014) 1st Chief Minister of the Ellice Islands from 2 October 1975 – 1 October 1978; 1st Prime Minister of Tuvalu from 1 October 1978 – 8 September 1981; 3rd Governor General of Tuvalu from 1 October 1990 – 1 December 1993. Sir Kamuta Latasi, KCMG OBE PC MP (born 1936) 4th Prime Minister of Tuvalu from 1993 until 1996; Speaker of the Parliament of Tuvalu from 2006 to September 2010 and again from December 2010 to March 2014.